Honda today starts the mass production of the New Civic as normal production resumes at its Swindon car plant, Honda of the UK Manufacturing Ltd (HUM), announcing the creation of 500 new jobs** to meet a forecasted production increase in 2012. 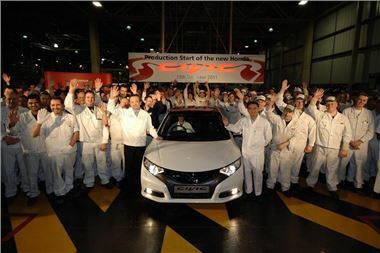 Start of volume production of the New Civic model was delayed by a month following the impact of the flooding of Honda's factories in Thailand. The operation was also affected earlier in the year by parts shortages caused by the earthquake and Tsunami in Japan. Honda Motor Europe President Manabu Nishimae speaking at the ceremony said Honda remained totally committed to building cars and engines in Europe with Swindon at the heart of Honda's European manufacturing activities and this is further demonstrated today with the launch of the New Civic. He added that Honda in Europe had turned a corner with a significant production increase expected in 2012. Announcing 500 new jobs**, HUM Director, Andy Piatek said that Car Plant 2 would return to a two shift operation in the late Spring of next year creating a need for the new jobs in addition to the current 3,000 Associates. Recruitment will start immediately through HUM’s dedicated website www.hondamanufacturingcareers.co.uk. During his speech to Honda Associates, Honda Motor Europe President Mr Nishimae acknowledged the workforces’ resilience, "The last three years have been extremely difficult for all of Honda's European operations. We have faced many challenges beginning with the economic downturn through to the two natural disasters in Japan and Thailand. Throughout this period Associates have remained committed and I am extremely proud of how they have responded to these challenges. We will build upon our new found strength and remain confident of our ability to achieve and succeed in the future." Commenting on Honda’s announcement, Prime Minister David Cameron said, "This is great news and a tremendous boost to the workforce, the car industry and UK manufacturing. Honda is contributing to a real renaissance in the UK automotive industry, we have a highly skilled workforce and we continue to be at the forefront of new technology and development. Its success is of great importance to our economy and we are committed to do all that we can to see this vital industry grow and thrive." Business Minister Mark Prisk added, "Today's announcement of the creation of 500 new jobs on the day that production started on the next generation of the Civic hatchback is a clear demonstration of Honda's continued commitment to the UK. "It is a huge vote of confidence in the skills of the Swindon workforce and the current strength of the automotive sector. The decision reinforces the message that the UK remains a great place to manufacture high quality products." Adding to the new Civic and the already successful Jazz, next year will see the mass production launch of the new European CR-V along with the production introduction of a small diesel engine also to be produced at Swindon. Production volume of cars for 2012 is forecast to double to 180,000 units.